Montessori+ is an innovative program initiated by Montessori International College to source out and form partnerships with local professionals, to utilise our campus spaces after school hours as a hub for artistic, creative and sporting pursuits. Montessori+ provides an opportunity for the Sunshine Coast Community to engage in after school, weekend and holiday programs, and have access to talented and experienced tutors all in the one location. The programs run after school from Monday to Friday from 3.30-6.00pm, on the weekends and holidays. Enrolments are open to adults and children and friends of the MIC community as well. Please see below for more information about our Montessori+. Follow Montessori+ on Facebook to keep up to date with all the exciting workshops coming up for all ages. Monday afternoons – ChessMates for 3-6 year olds and ChessMates for 7-12 years For further information please email Leah Gauci via leah@chessmates.com.au or fill in the Registration Form. 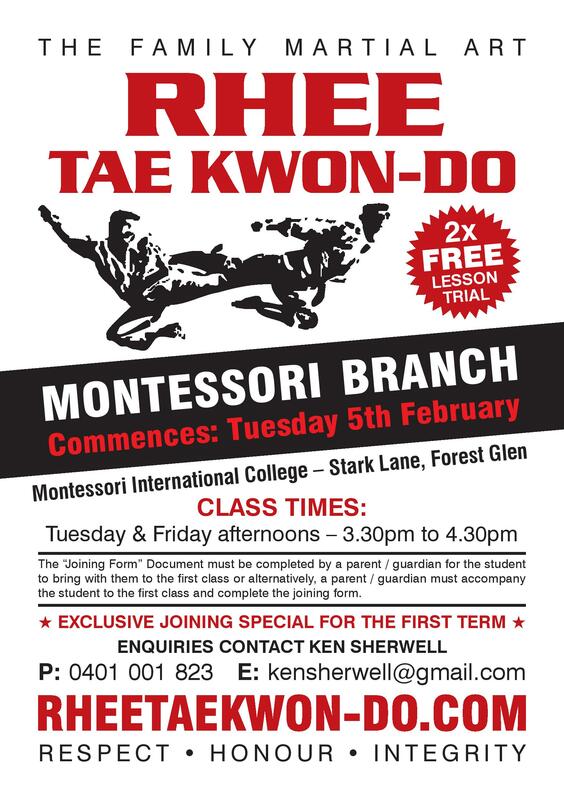 Tuesday & Friday afternoons – Rhee Taekwondo from 5 years of age. Follow the link for more details or to register your interest. Please email Ken Sherwell on kensherwell@gmail.com with any queries or alternatively please complete the Registration Forms. Wednesday afternoons – Film & TV Acting Course for 8-12 year olds and Film & TV Acting Course for 13-18 year olds. Please follow the link for more details. Or to register your interest, please email Tam Sainsbury via tam@geminiartsandmedia.com. Thursday afternoons – Senior Primary Yoga for 9-12 year olds and Teens & Adult Yoga for 13+ year olds and adults. Please follow the for more details. Great opportunity to build some new skills and explore your capabilities. It is so wonderful to be able to book my children into 3 workshops in one day over the holidays to learn new skills - crocheting, cupcake decorating & Confidence Building workshops. Tutors are very talented and experienced! In my time tutoring at MIC, I have met some incredible individuals and groups. From organising with ease, the workshop details with the amazing MIC Staff to running classes with all incredible participants – forever eager to partake in the hour's activities. Each week would see participants arrive with energy and eagerness, and leaving, with equal enthusiasm – there to learn and partake every time. I have had participants come along when feeling under the weather, or very time poor, attending knowing that the workshop is time for themselves and holds great value. It has been nothing but a pleasure to run workshops at MIC over the past 18 months, and I look forward to continuing doing so in the future. I have absolutely loved using the space at the Montessori school to run my Intuition4Kids workshops. Marina has been so friendly, helpful and easy to liaise with. The venue is perfect! It has beautiful indoor spaces for the children to do activities, all the spaces we could ever require. A place to sit on the floor in a circle, tables to draw at, outside area to have morning tea, a big field to run around and connect with the earth and a little forest to explore as part of our learning. I had tried many other places before finding the Montessori school and nothing has even come close. I am so happy with the little community feeling the school has and how welcome I have felt coming here to run my school holidays workshops for kids. Have a general enquiry? We would love to hear from you.